Huynh et al., 1998 notes that at the biochemical level, microalgal toxins are genotoxic and can affect DNA adducts (Huynh et al., 1998). At the cellular level, though, Huynh et al. also notes that toxins can be cytolytic, hemolytic, antieoplastic, or tumor inducing. At the organ level, toxins can be neurotoxic, dermatoxic, or hepatoxic. Neurotoxic paralytic shellfish toxins (PSTs) are also produced by the following cyanobacteria: Anabaena circinalis, Aphanizomenon flos-aquae, Cylindrospermopsis raciborskii, and Lyngbya wollei. PSTs present significant concerns for public health officials as well as drinking water treatment specialists. As extremely potent neurotoxins, PSTs are highly lethal. Symptoms of paralytic shellfish poisoning (PSP) include paresthesia and numbness, particularly around the face and neck. Effects of microcystin on organisms can also be lethal when administered in high doses. In humans, symptoms of microcystin poisoning include diarrhea, vomiting, piloerection, weakness, and pallor (Bell & Codd, 1994). Microcystin toxins specifically target the liver and can cause significant cytoskeletal damage, necrosis, and pooling of blood, which can increase liver weight by up to 100% (Hooser et al., 1989). Microcystin disrupts the liver's cytoskeleton, which leads to loss of cell morphology, loss of adhesion from cell-to-cell, and cellular necrosis. At especially toxic doses, microcystin causes disorganization of tissue, which leads to massive hepatic hemorrhage, which can be lethal within a few hours after administering the dosage (Hoosner et al., 1989). In addition to liver damage, microcystins also promote tumor growth in humans by inhibiting the protein enzyme's phosphatase type 1 and 2A activities (Eriksson et al., 1990). In February of 1996, a hemodialysis center in Caruaru, Brazil exposed 116% patients to acute levels of microcystin toxins via water supplied from a nearby- contaminated reservoir by cyanobacteria. Of the 100 patients who were affected, 52% died (Jochimsen et al., 1998). Although there have been reports of human deaths caused by inadvertent injection of microcystins, there have been no reports caused by the direct ingestion of such toxins (Butler et al., 2009). Aside from the direct health risks cyanobacteria pose, toxins can also leave communities vulnerable to a variety of indirect consequences. One of the foremost concerns public officials have on HABs is in the area of drinking water quality and treatment. In August of 2014, approximately 500,000 residents of the Greater Toledo, Ohio region were advised not to drink water via tap and were recommended to use bottled water for showering, bathing, brushing teeth, and washing dishes. In addition to emergency warnings on drinking water supplies, microcystin toxins forced local restaurants, universities, and public libraries to close. The National Guard was also deployed in order to deliver cases of bottled water from Akron, Ohio, to residents who were especially vulnerable. The EPA currently does not have standards and regulatory limits associated with cyanobacterial toxin concentrations provided for public water systems. However, many states have implemented guidelines that apply to cyanotoxins and cyanobacteria in drinking water. Many of these states utilize standards set forth by the World Health Organization (WHO) of the United Nations, which has a standard of 1 μg/L for microcystin-LR (Rao et al., 2002). HABs present biological systems with an array of challenges. Often, these stressors not only affect wild species, but also human society as well. Estimating the economic impacts HABs create is important for policymakers and environmental advocates to determine the level of effort that mitigation and remediation treatments should yield. However, it should be noted that estimating the social and environmental costs associated with HABs is difficult and values should be exercised with caution. Nevertheless, the provision of a comprehensive economic analysis can be highly valuable for agriculturally driven communities that are in the process of weighing the costs and benefits of using chemical fertilizers that contain phosphates and/or nitrogen. In 2013, the city of Toledo, Ohio allocated $4 million USD for water treatment chemicals, which was doubled from what it spent in 2010 (Henry & Writer, 2015). 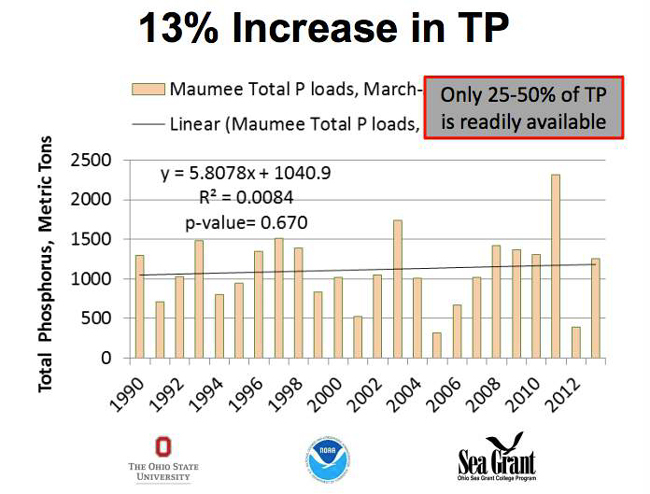 In 2014, blooms around Maumee bay and areas of western Lake Erie were especially concentrated and thick, and prompted the city to deliver its drinking water emergency advisory. This resulted in total spending to increase to $4.7 million USD for water treatment chemicals (Henry, 2014). Monitoring tasks by municipal, state, and federal governments include the testing, treatment, and management of infrastructure and facilities that are designed to sustain large populations with a consistent supply of water. Monitoring programs that are designed to look for PSTs in particular, had an average annual monitoring and management cost that totaled $2.89 million USD in the United States in 2000 (adjusted for 2015) (Hoagland et al., 2002). However this figure only factored in 12 total states and did not account for HAB occurrences in any of the Great Lakes. In addition to water treatment and monitoring costs, a number of industries along Ohio's Lake Erie coastline are directly affected by HABs. In 2013, Tourism Economics calculated that total sales from tourism were valued at $12.9 billion USD across the Ohio coastline (Winslow, 2015) . The industry helps employ over 119,000 people and generates over $1.7 billion total in tax revenue for federal, state, and local governments. Increasing HAB occurrences primarily threaten the tourism industry by limiting land area recreational usage. However, the tourism industry in particular, may be the most significant industry affected by HABs. It was estimated in 1975 that economic damage to the tourist industry of a summer 1971 Gymnodinium breve red tide event amounted to over $93 million (Habas & Gilbert, 1975) (adjusted for 2015). Future research should estimate similar impacts to the tourism industry along Ohio's coastline. HABs also can affect property values and the real estate industry along Ohio's shorelines. This is due to both decreased recreational and aesthetic values associated with algal bloom sights and smells. While several news reports reference property value losses as a result of algal blooms along western Lake Erie's shores, there is currently limited scholarly research in this area. The commercial fishing industry is the most directly affected industry by HABs in western Lake Erie. The industry is especially important both socially and economically for both Ohio Buckeyes and Ontarians. Overall, the industry is worth approximately $50 million CDN and employs around 715 people (Hill, 2015). The fish processing industry in Lake Erie has an economic impact of approximately $194 million CDN and employs around 755 people. In total, the industry amasses over $244 million CDN and employs over 1,490 people either directly or indirectly. Several news reports have suggested decreased earnings during algal blooms in western Lake Erie, although scholarly surveys are currently limited and should therefore be investigated. 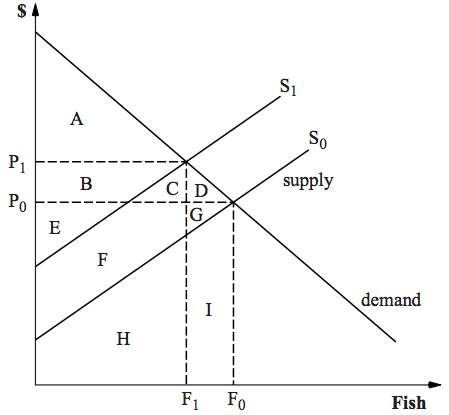 HAB events harbor the potential to shift the supply of fish inwards, which simultaneously increases cost and decreases quantity demanded. Both producer and consumer surpluses are therefore shrunk and total economic losses are incurred on society. Lastly, human sickness and death from exposure to cyanotoxins in Lake Erie has the potential to significantly increase both the economic and social cost of HAB events. Costs of widespread medical treatment due to an algal outbreak in drinking water could pose significant economic concerns for communities. While relatively few cases have thus far been reported, the region's population of over one million residents raises the risk of such an outbreak to occur in the future. With expected increasing temperatures in the region due to anthropogenic climate change, these risks may be further elevated. Overall, HABs pose a variety of costs and risks related to the health of Lake Erie's economy. Furthermore, due to the frequent recurrence of such events, annual costs are multiplied over the long run and threaten the existence of industries and communities reliant on the lake's resources. While few data are available to complete a comprehensive overview on the economic effects of eutrophication- induced HABs in Lake Erie, researchers have been able to build framework models that can quantitatively estimate overall impacts. A joint study commissioned by the Woods Hole Oceanographic Institution in September of 2000 estimated the average total annual economic impacts from HABs in the U.S. amounts to be over $67 million USD (adjusted for 2015), which included public health, commercial fishery, recreation/tourism, and monitoring/management costs (Anderson et al., 2000). Future research should develop a framework that estimates the total balance between both the benefits and costs incurred by using chemical fertilizers that contain phosphorus and nitrogen. Fertilizers consist of a wide array of materials of either natural or synthetic origin that are used to supplement the growth of plants through their application to soils or plant tissues directly. In the context of this paper, fertilizers will reference only those materials that contain phosphates and nitrogen. Nitrogen fertilizers are most often derived from ammonia (NH3). Ammonia itself is produced through the Haber-Bosch process (N2 + 3 H2 → 2 NH3), which is highly energy-intensive. In 2009, Sarah Simpson published in the sustainability section of Scientific American, "Nitrogen Fertilizer: Agricultural Breakthrough And Environmental Bane" (Simpson, 2009). While the article gives a nod to Chemist Fritz Haber's discovery of ammonia's synthesis, which has enabled the widespread fertilization of croplands globally, Simpson notes that nitrogen-based "nutrients often spur harmful algal blooms as they flow into the ocean, and hundreds of estuaries around the world suffer from so-called seasonal dead zones as a result." (Simpson, 2009). The article goes on to cite some of the more beneficial products nitrogen fertilizers have been able to yield, such as biofuels. 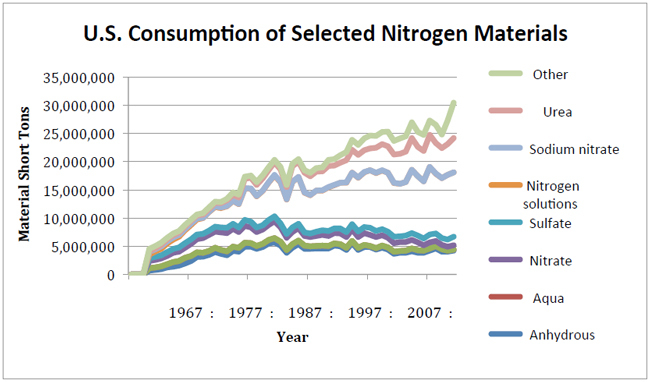 The total consumption of nitrogen fertilizers in the United States has increased significantly over the last 50 years. Increased consumption has largely been driven by scholarly research, which has shown a strongly significant and positive effect on total crop yields by increased inputs of nitrogen fertilizers (Lawlor et al., 2001), (Jagadamma et al., 2008). However, with the rise of environmental concerns with respect to nitrogen leaching and eutrophication, many scholars and practitioners have developed management techniques to maximize the use of nitrogen inputs, while limiting external effects on the environment. A joint study by Texas A&M University and the Tennessee Valley Authority investigated the impact that chemical use reduction had on yields for eight major agricultural crops in the U.S (Smith et al., 1990). Overall, results showed that U.S. corn yields would decline by 41%, cotton by 37%, rice by 27%, barley by 19%, sorghum by 19%, and wheat by 16% when grown without any added nitrogen. Economically speaking, this would result in similar figures according to pricing of each respective crop. Lowered crop prices are important for the provision of local and regional food supplies, due to the variable elasticity of demand for food by food type. In addition to decreasing prices associated with nitrogen use, there is also considerable evidence that nitrogen fertilizers have significantly helped support the supply for food globally, which is important for communities to support food security (Tilman et al., 2002). In total, evidence is clear that the benefits to society, by using nitrogen fertilizers for increased cropland yields, are high. The second main chemical that helps spur cyanobacterial growth through fertilizer eutrophication in western Lake Erie is phosphorus. Phosphate fertilizers are primarily extracted from minerals that contain the anion PO43−. Like nitrogen fertilizers, phosphate fertilizers use has also increased over the last 50 years. Phosphorus is vital for plants to grow, as the chemical is used to transfer and store energy within their cells. An adequate supply of phosphate nutrients enables plants to grow rapidly and mature earlier than those plants without such a supply. Specifically, phosphorus is most abundant in plants in the early stages of tissue growth. Plants without an adequate supply of phosphorus become stunted and can turn shades of purple or brown. Agronomic experiments with phosphate fertilizers have provided evidence for increasing crop and plant yields with increasing phosphate application (Pasda et al., 2001). However, the agronomic effectiveness of phosphate fertilizers is largely attributed to the capacities of the soil to retain and release the chemical (Ozanne & Shaw, 1967). As the phosphorus retention capacity of the soil increases, however, a larger amount of phosphate fertilizers are needed in order to produce the same output yield. 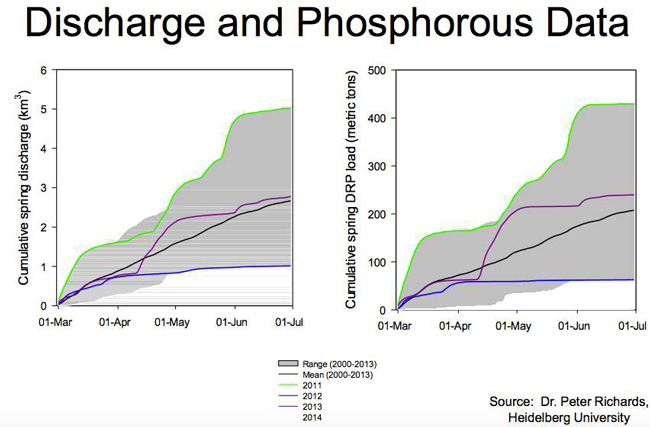 Total benefits of phosphorus are significant when considering total agricultural output. Like nitrogen, phosphate fertilizers promote the opportunity to further food security by increasing crop yields and decreasing food prices. Completing a qualitative analysis on chemical fertilizer use in the Lake Erie basin required the development of a decomposition framework. By decomposing both direct and indirect effects, it's possible for practitioners and stakeholders to assign weighted values per each of the variables analyzed, and therefore make recommendations for remediation efforts and policies going forward. Overall, effects of eutrophication via uses of chemical fertilizers on agricultural land surrounding Lake Erie are substantial. Additionally, the benefits Ohio communities gain out of using chemical fertilizers are sizable as well. It is generally reasonable to argue net costs outweigh net benefits. However, due to biased weighting, assigning greater value towards particular variables over others is discriminatory in nature. When considering total costs and benefits of chemical fertilizer use in the Ohio Lake Erie basin, it is important to note the qualitative nature many variables exhibit. This is largely due to the difficulty in setting social prices according to many of the externalities that affect ecological, environmental, and human health outcomes. However, it is possible to set economic prices according to the effects chemical fertilizer use has on industrial, public health, governmental, and agronomic variables. Future research should therefore investigate total aggregate effects of chemical fertilizer use in the Lake Erie basin, with regards to a full quantitative analysis of its costs and benefits. Deciding whether the costs of chemical fertilizer use outweighs its benefits presents many issues underlying variable ambiguity. Eutrophication-induced HABs present a diverse range of issues for ecosystems and communities in the western Lake Erie region. Microcystin and other toxins produced by cyanobacteria harm many organisms along the food chain, human health, and economic viability in core industries that are reliant on the lake's resources. Providing Lake Erie stakeholders with an overview of these effects, how they are caused, and the mechanisms by which they transpire is useful for creating pragmatic and enduring solutions for the future. With a long history of agricultural innovation and entrepreneurship, Ohio has the capability to further develop and grow its communities and industry. While chemical fertilizers provide farmers with the opportunity to increase yields and reduce costs of agricultural products, they present unintended consequences to the environment, society, and the economy at-large. Cyanotoxins produced by eutrophication-induced algae growth directly harms numerous species, including various zooplankton, fish, reptiles, and birds. Additionally, microcystins harm human health by damaging liver processes and inducing tumor growth. By reviewing both these consequences and gains, stakeholders will have access to a comprehensive vantage point on the effects of chemical fertilizer use in Ohio. Almeida, Z. (2015). How is Fish Habitat Affected? : Lake Erie's Dead Zone. In Old Woman Creek National Estuarine Research Reserve Technical Bulletin (Vol. 3). Columbus, OH: Ohio Department of Natural Resources, Division of Wildlife. Bell, S. G., & Codd, G. A. (1994). Cyanobacterial toxins and human health Reviews in Medical Microbiology, 5(4), 256-264. Butler, N., Carlisle, J. C., Linville, R., & Washburn, B. (2009). Microcystins: a brief overview of their toxicity and effects, with special reference to fish, wildlife, and livestock. California Environmental Protection Agency, Sacramento, 5. Cordell, D., Drangert, J. O., & White, S. (2009). The story of phosphorus: global food security and food for thought. Global environmental change, 19(2), 292-305. DeMott, W. R., Zhang, Q. X., & Carmichael, W. W. (1991). Effects of toxic cyanobacteria and purified toxins on the survival and feeding of a copepod and three species of Daphnia. Limnology and Oceanography, 36(7), 1346-1357. Eriksson, J. E., Toivola, D., Meriluoto, J. A. O., Karaki, H., Han, Y. G., & Hartshorne, D. (1990). Hepatocyte deformation induced by cyanobacterial toxins reflects inhibition of protein phosphatases. Biochemical and biophysical research communications, 173(3), 1347-1353. Forsyth, D. J., Haney, J. F., & James, M. R. (1992). Direct observation of toxic effects of cyanobacterial extracellular products on Daphnia. Hydrobiologia, 228(2), 151-155. Fulton, R. S. (1988). Grazing on filamentous algae by herbivorous zooplankton. Freshwater Biology, 20(2), 263-271. Fulton, R. S., & Paerl, H. W. (1987). Toxic and inhibitory effects of the blue-green alga Microcystis aeruginosa on herbivorous zooplankton. Journal of Plankton Research, 9(5), 837-855. Gilbert, J. J. (1990). Differential effects of Anabaena affinis on cladocerans and rotifers: mechanisms and implications. Ecology, 1727-1740. Habas, E. J., & Gilbert, C. (1975). A preliminary investigation of the economic effects of the red tide of 1973-1974 on the west coast of Florida. In Proceedings of the First International Conference on Toxic Dinoflagellate B.532 (p. 1975). Haney, J. F., Sasner, J. J., & Ikawa, M. (1995). Effects of products released by Aphanizomenon flosàquae and purified saxitoxin on the movements of Daphnia carinata feeding appendages.Limnology and Oceanography, 40(2), 263-272. Henry, T. (2014). Toledo's water chemical cost up by $1.7M. The Blade. Retrieved December 4, 2015. Henry, T., & Writer, B. S. (2015). Ohio higher ed spending millions on algae fight. Policy, 1, 28. Hietala, J., Reinikainen, M., & Walls, M. (1995). Variation in life history responses of Daphnia to toxic Microcystis aeruginosa. Journal of Plankton Research, 17(12), 2307-2318. Hill, S. (2015, March 25). $244M Economic Impact Shows Importance of Lake Erie Commercial Fishery. Windsor Star. Retrieved December 4, 2015. Hoagland, P., Anderson, D. M., Kaoru, Y., & White, A. W. (2002). The economic effects of harmful algal blooms in the United States: estimates, assessment issues, and information needs. Estuaries, 25(4), 819-837. Hooser, S. B., Beasley, V. R., Lovell, R. A., Carmichael, W. W., & Haschek, W. M. (1989). Toxicity of microcystin LR, a cyclic heptapeptide hepatotoxin from Microcystis aeruginosa, to rats and mice. Veterinary Pathology Online, 26(3), 246-252. Huynh, C., Pinelli, E., Puiseux-Dao, S., Boulekbache, H., & Pfohl-Leszkowicz, A. (1997). Okadaic acid and DNA adduct formation. Toxicon, 35(12), 1665-1666. Infante, A., & Abella, S. E. (1985). Inhibition of Daphnia by Oscillatoria in Lake Washington. Limnology and oceanography, 30(5), 1046-1052.
International Organization for Standardization (2005). Water Quality: Determination of microcystins -method using solid phase extraction (SPE) and high performance liquid chromatography (HPLC) with ultraviolet (UV) detection. ISO, Geneva, Switzerland (ISO 20179:2005). Jagadamma, S., Lal, R., Hoeft, R. G., Nafziger, E. D., & Adee, E. A. (2008). Nitrogen fertilization and cropping system impacts on soil properties and their relationship to crop yield in the central Corn Belt, USA. Soil and Tillage Research, 98(2), 120-129. Jochimsen, E. M., Carmichael, W. W., An, J., Cardo, D. M., Cookson, S. T., Holmes, C. E., ... & Jarvis, W. R. (1998). Liver failure and death after exposure to microcystins at a hemodialysis center in Brazil. New England Journal of Medicine, 338(13), 873-878. Kirk, K. L., & Gilbert, J. J. (1992). Variation in herbivore response to chemical defenses: zooplankton foraging on toxic cyanobacteria. Ecology, 2208-2217. Knepper, G. W. (2003). Ohio and its People. Kent State University Press. Kotak, B. G., R. W. Zurawell, E. E. Prepas, and C. F. B. Holmes (1996). Microcystin-LR concentration in aquatic food web compartments from lakes of varying trophic status. Can. J. Fish. Aquat. Sci., 53: 1974–1985. Lampert, W. (1987). Laboratory studies on zooplankton-cyanobacteria interactions. New Zealand Journal of Marine and Freshwater Research, 21(3), 483-490. Landsberg, J. H. (2002). The effects of harmful algal blooms on aquatic organisms. Reviews in Fisheries Science, 10(2), 113-390. Lawlor, D. W., Lemaire, G., & Gastal, F. (2001). Nitrogen, plant growth and crop yield. In Plant nitrogen (pp. 343-367). Springer Berlin Heidelberg. Lewitus, A. J., Horner, R. A., Caron, D. A., Garcia-Mendoza, E., Hickey, B. M., Hunter, M., ... & Tweddle, J. F. (2012). Harmful algal blooms along the North American west coast region: History, trends, causes, and impacts. Harmful Algae, 19, 133-159. Michalak, A. M., Anderson, E. J., Beletsky, D., Boland, S., Bosch, N. S., Bridgeman, T. B., ... & Zagorski, M. A. (2013). Record-setting algal bloom in Lake Erie caused by agricultural and meteorological trends consistent with expected future conditions. Proceedings of the National Academy of Sciences, 110(16), 6448-6452. Myers, S. C. (2005). Renewable Polymers and Advanced Materials. National Agricultural Biotechnology Council Report. National Agricultural Statistics Service (2010). Agricultural Chemical Usage. Washington, DC: U.S. Department of Agriculture. Natural Resources Conservation Service (2011). Terms and Definitions E to F. U.S. Department of Agriculture. Web. 21 Nov. 2015. Negri, A. P., & Jones, G. J. (1995). Bioaccumulation of paralytic shellfish poisoning (PSP) toxins from the cyanobacterium Anabaena circinalis by the freshwater mussel Alathyria condola. Toxicon, 33(5), 667-678. New York State Department of Environmental Conservation (2005). Comprehensive. Wildlife Conservation Strategy for New York. pp. 235-236. Ohio Department of Natural Resources (2007). Soil Regions of Ohio. (Division of Soil and Water Conservation). Columbus, OH. Ohio Legislative Service Commission (1997). Ohio's Natural Resources & Energy. Columbus, OH. Print. Retrieved October 25, 2015. Ozanne, P. G., & Shaw, T. C. (1967). Phosphate sorption by soils as a measure of the phosphate requirement for pasture growth. Crop and Pasture Science, 18(4), 601-612. Pasda, G., Hähndel, R., & Zerulla, W. (2001). Effect of fertilizers with the new nitrification inhibitor DMPP (3, 4-dimethylpyrazole phosphate) on yield and quality of agricultural and horticultural crops. Biology and Fertility of Soils, 34(2), 85-97. Pawlowicz, M., Evans, J., Johnson, D., & Brooks, R. (2006). A study of the efficacy of various home filtration substrates in the removal of microcystin-LR from drinking water. J Water Health, 4, 99-107. Peter, H., & Lampert, W. (1989). The effect of Daphnia body size on filtering rate inhibition in the presence of a filamentous cyanobacterium. Limnology and Oceanography, 34(6), 1084-1089. Ramsy Agha, Samuel Cirés, Lars Wörmer and Antonio Quesada (2013). "Limited Stability of Microcystins in Oligopeptide Compositions of Microcystis aeruginosa (Cyanobacteria): Implications in the Definition of Chemotypes." Toxins. Rao, P. V., Gupta, N., Bhaskar, A. S., & Jayaraj, R. (2002). Toxins and bioactive compounds from cyanobacteria and their implications on human health. Journal of environmental biology/Academy of Environmental Biology, India, 23(3), 215-224. Reinikainen, M., Ketola, M., & Walls, M. (1994). Effects of the concentrations of toxic Microcystis aeruginosa and an alternative food on the survival of Daphnia pulex. Limnology and Oceanography, 39(2), 424-432. Ribaudo, M., Hansen, L., Livingston, M., Mosheim, R., Williamson, J., & Delgado, J. (2011). Nitrogen in agricultural systems: Implications for conservation policy. USDA-ERS Economic Research Report, (127). Rinta-Kanto, J. M., Konopko, E. A., DeBruyn, J. M., Bourbonniere, R. A., Boyer, G. L., & Wilhelm, S. W. (2009). Lake Erie Microcystis: relationship between microcystin production, dynamics of genotypes and environmental parameters in a large lake. Harmful Algae, 8(5), 665-673. Schneegurt, M. A. (2000). Cyanobacteria. In Robinson, R. (ed), Plant Sciences for Students, Macmillan, NY. Sellner, K. G. (1997). Physiology, ecology, and toxic properties of marine cyanobacteria blooms. Limnology and Oceanography, 42(5part2), 1089-1104. Smith, E.G., R.D. Knutson, C.R. Taylor, and J.B. Penson, Jr. Impacts of Chemical Use Reduction on Crop Yields and Costs. Tennessee Valley Authority and Texas A&M University System Cooperating, May, 1990. Stangenberg, M. (1968). Toxic effects of Microcystis aeruginosa Kg. extracts on Daphnia longispina OF Müller and Eucypris virens Jurine. Hydrobiologia, 32(1), 81-87. Tilman, D., Cassman, K. G., Matson, P. A., Naylor, R., & Polasky, S. (2002). Agricultural sustainability and intensive production practices. Nature, 418(6898), 671-677. Winslow, C. (2015). Ecological and Economic Importance of Lake Erie and the Impacts of Harmful Agal Blooms. The Ohio State University. Web. 5 Dec. 2015. U.S. Census Bureau (1970). "Census of Population: 1970, Part 37 – Ohio, Section 1" (PDF). U.S. Department of Commerce. Retrieved October 10, 2015. Yasuno, M., & Sugaya, Y. (1991). Toxicities of Microcystis viridis and the isolated hepatotoxic polypeptides of Cladocerans. Internationale Vereinigung fuer Theoretische und Angewandte Limnologie Verhandlungen IVTLAP, 24(4).